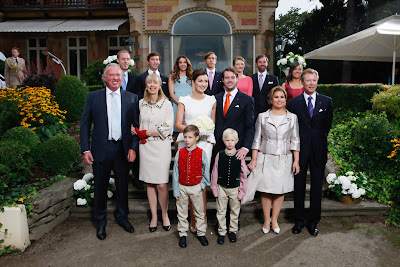 A few camera teams were on site to cover the wedding of Prince Félix and Princess Claire in Königstein today. German HR has two reports which are most conveniently accessible via ARD, one and two. As of right now, RTL has a short video of what happened at the photocall after the wedding. They also had a lengthy report on the evening news though that one isn't available as of yet. (Update: Here you go. It starts at about 3:00 and includes an interview with the bridal couple in which Félix tells in Luxembourgish that the "civil wedding is a moment of great joy for me" to which Claire adds in German "For us".) Wort also has a video of the day's events in Luxembourgish. I also noticed France 2 (or was it France 3?) at the wedding. If anyone finds their report, let us know! Not videos but the cour has already uploaded a bunch of lovely pictures of the ceremony itself. Definetely worth checking out. In addition, the witness for Saturday's civil wedding have become known and beware, there is a whole lot of them! Prince Félix has chosen his youngest brother Prince Sébastien, his brother-in-law Félix Lademacher as well as his friends Peter Cauro, Xavier Cauro, Don Lawrence Doimi de Frankopan, who was already one of Hereditary Grand Duke Guillaume's witnesses, and Richard Thistlewaite. Meanwhile Princess Alexandra, Patricia Caspar, Andrea Latten, Anna-Maria Pamin, Maria Sanchez and Lola Toscani will stand on witness duty for Princess Claire. The bridal children for Saturday will be the couple's nephews, Prince Gabriel and Prince Noah, as well as Flora and Katharina Doimi de Frankopan, daughter of Don Peter.